The very first playthrough took me three weeks. How fast can it be done? I’m finally off work, refreshed and energized. What better way to make a comeback than to tear my way through one of my favourite games of all time? I’ve been talking about doing this since June’s update post…. well here we go! I’ve beaten this game countless times on several systems, but haven’t been back to it for 5-6 years. Some things are ingrained into my brain, like the Safe combination in one of the offices (2236 folks!) But I needed a test run to re-familiarise myself before going for gold here. 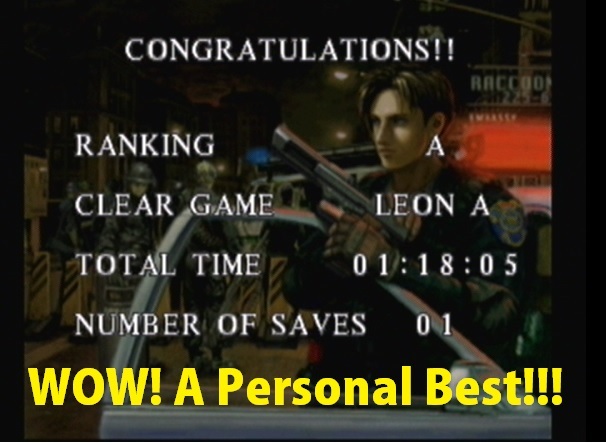 My objective is to smash through the Gamecube version of RE2 as fast as humanly possible, so it’s on easy mode. I skip all the cut scenes to save time, but I’ll fill you in on what you’ve missed as we go. There are nervy moments, times where I go into the wrong room or forget an item – but in the end I’m chuffed to bits with the result! For those who don’t fancy watching the video here’s my final time! Posted on November 30, 2016 November 30, 2016 by itsonlyleggyPosted in Miscellaneous, Retro, VideoTagged Gamecube, Resident Evil, Resident Evil 2, Speedrun, Video.